The February 2, 1876 Daily British Colonist contained a statement of income and expenditures for the City of Victoria for the year ended December 31, 1875 showed an expenditure of $50 for City Hall designs. Up to then there had been no City Hall and council meeting were held in the police barracks on what is now Bastion Square. In 1876, Council spent $300 on City Hall Designs. 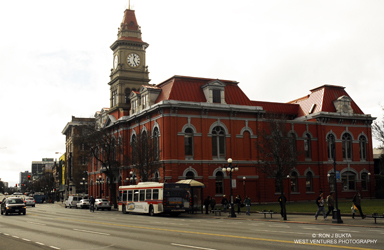 City Hall was finally constructed in 1878 – with additions in 1881 and 1891 – to a design by John Teague. Its second empire style reflects the post-confederation usage of this style across Canada for public buildings.